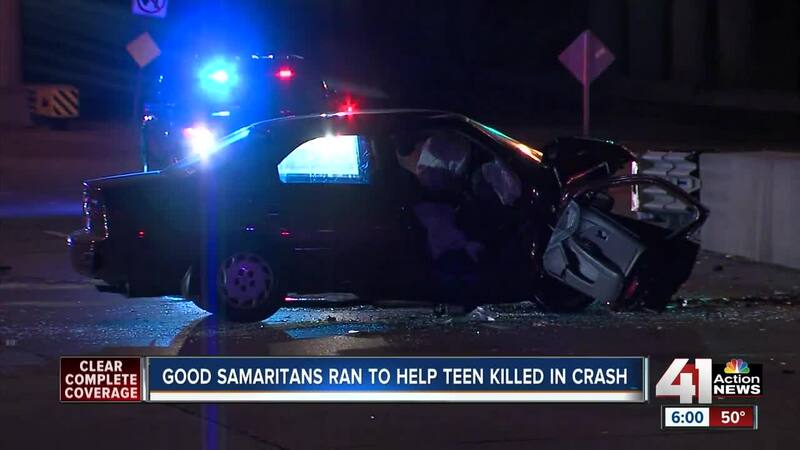 A 19-year-old woman died in a crash late Monday night in Overland Park, Kansas. OVERLAND PARK, Kan. — A 19-year-old woman died in a crash late Monday night in Overland Park, Kansas. It happened as she was exiting off 69 Highway and College Boulevard. Before first responders arrived on scene, good Samaritans stepped into help. Andy Dubill was driving home to turn in for the night when he and his wife drove up on the crash. "We were coming home about 11 p.m. and we drove off of 69 to turn right on College and my wife said, Andy, there's a car smoking right ahead of us," said Dubill. Not knowing what happened, Dubill got out of the car and ran to help. "The car had hit the barrier so hard, it accordion-ed and we couldn't get the doors opened," said Dubill. As his wife called 911, Dubill and others who had stopped at the scene did everything they could until first responders arrived. "I didn't see any movement and all the calling we did to the person while we were trying to open the door, got no response," said Dubill. Overland Park Police said a 19-year-old woman was killed in the crash after her car hit a concrete barrier. "It could be very confusing for somebody who wasn't aware of it," said Dubill. Overland Park Police said Monday night's crash was the first deadly crash at the intersection in the past two years. Since 2017, police have responded to 103 accidents at 69 Highway and College Boulevard. Dubill said in his eight years living nearby, he's never experienced a crash like this. With eight grandchildren of his own, he said it hit home. "You know, you say a prayer for the person and their family and you think at this time of the year, what could be worse than going through a situation where you have to bury a child," said Dubill. Police are still investigating the crash and have not released the woman's name.